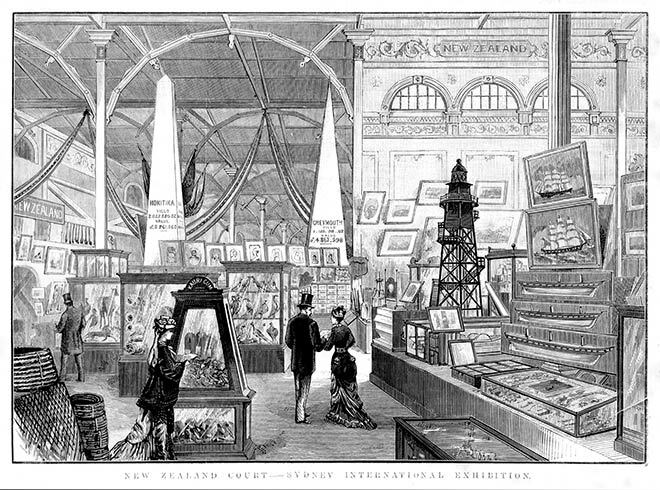 This illustration of the New Zealand display at the Sydney exhibition shows the importance to the country of trade in natural products. In the foreground can be seen a cabinet of kauri gum and bales of flax rope. In the background are two obelisks representing the amount of gold produced by the Hokitika and Greymouth fields; and on the right are images of the ships that carried goods to and from New Zealand and the model of a lighthouse which protected the shipping.